The board awarded Fresno State a $124,541 grant with options through 2019. If all options are renewed the contracts will total $1,120,890. The agreement follows a five-year grant from the board that concluded in September. The grant will help the center continue to develop partnerships with city and county water planning and conservation departments, area industries, state and federal legislators and water resource agencies, as well as educational institutions. The staff will continue to provide assistance to water cluster members through their quarterly meetings that bring together leaders from industry, government and education fields to examine relevant topics. 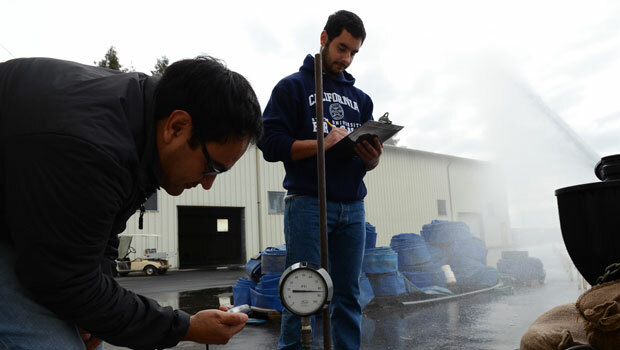 The International Center for Water Technology is one of several water research organizations located on the Fresno State campus that include the Center for Irrigation Technology, the California Water Institute and the Water, Energy and Technology Center. Fresno State is also a partner in the Blue-Tech-Valley initiative – partnership between Fresno State, government, water agencies and private industry to make the San Joaquin Valley the hub of water research and technological innovation to serve worldwide needs. Water management research and technology has been a major emphasis under second-year University President Joseph I. Castro. His Commission for the Future of Agriculture targeted the theme in its May report, while a team of faculty and community members look to publish its report this spring. For more information contact Laura Ramos at lramos@csufresno.edu or 559-278-2066.